Vanilla gets a bad rap, doesn't it? It's equated with being plain and boring. Sure, when vanilla, particularly vanilla cake or cupcakes, is done poorly it's pretty "meh". But when vanilla cake or cupcakes are done well they are delicious. And let me tell you, these vanilla cupcakes are delicious! They make the perfect foundation for any other flavor, filling, frosting, or just all on their own. I have been testing out vanilla cupcake recipes for a while. Everything from Martha Stewart to How to Cake It. While everything I tried was good and definitely tasty, nothing really knocked my socks off until this recipe. These cupcakes are light and airy, yet moist and rich. They pack a serious vanilla punch that is anything but plain and boring. Cake flour is nice and all, and will definitely make the texture of the cupcakes a bit lighter and softer, but it is not necessary. You can still make a darn good cupcake with all purpose flour. Always use whole milk. I have learned over the years that when it comes to baking (and lots of other things, actually), whole milk is king. Please do not use 2% or (dare I even say it) skim. And if you do, don't tell me about it, k? Measure your flour by spooning your flour into the measuring cup, then level. While some other recipes are a little bit more forgiving with the amount of flour, you don't want to weigh down your cake or cupcakes with any more flour than the recipe calls for. To make these cupcakes start by whisking together all your dry ingredients. If you want to ensure that there are no lumps, you can run everything through a sifter. I find that giving it a good whisk pretty much does the job. Set the dry mixture aside and cream together the butter and sugar, then mix in the eggs (preferable 1 at a time, but I am a little impatient when it comes to cake). Now for the good stuff. 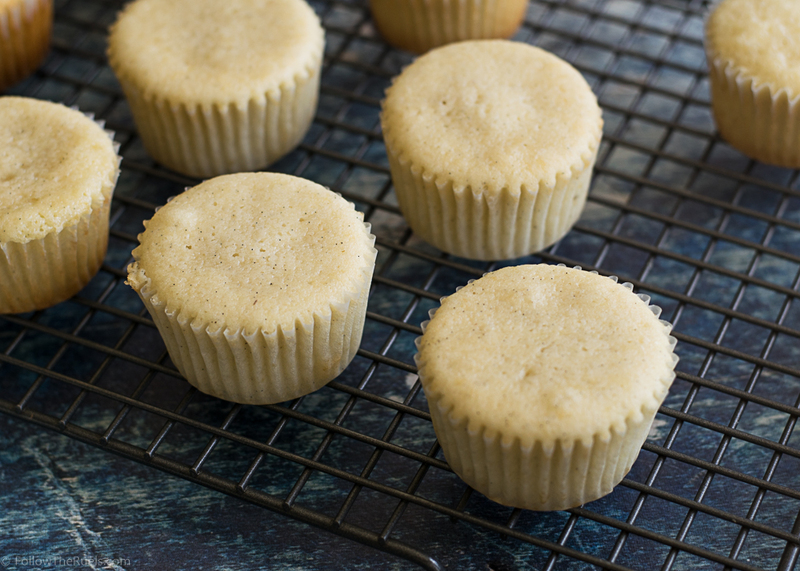 I like using vanilla bean paste in these cupcakes because the flavor is so concentrated and rich. It really makes the flavor of these cupcakes stand out. Plus, I like the little vanilla beans speckled throughout the cake. If you don't have vanilla bean paste, don't fret! You can substitute with the seeds of one vanilla bean (split in half, and scrape a knife over the inside, scraping out all the seeds) and a bit of vanilla extract. If you only have vanilla extract, just add a bit more. With the butter, sugar, eggs, and vanilla all mixed together, its time to mix in the flour and the milk alternating between the two. I like to mix the flour in 3 parts and the milk in 2 parts. So I mix flour-milk-flour-milk-flour. Always start and end with dry ingredients. I am not sure the exact reason for this mixing method, but I have found that alternating between wet and dry, you get a smoother batter and a lighter cake. Bake the cupcakes until they are just cooked all the way and a toothpick comes out mostly clean. I take my cupcakes out before they brown too much and when there are still some crumbs that stick to the toothpick. That way they are nice and moist and not dried out at all! 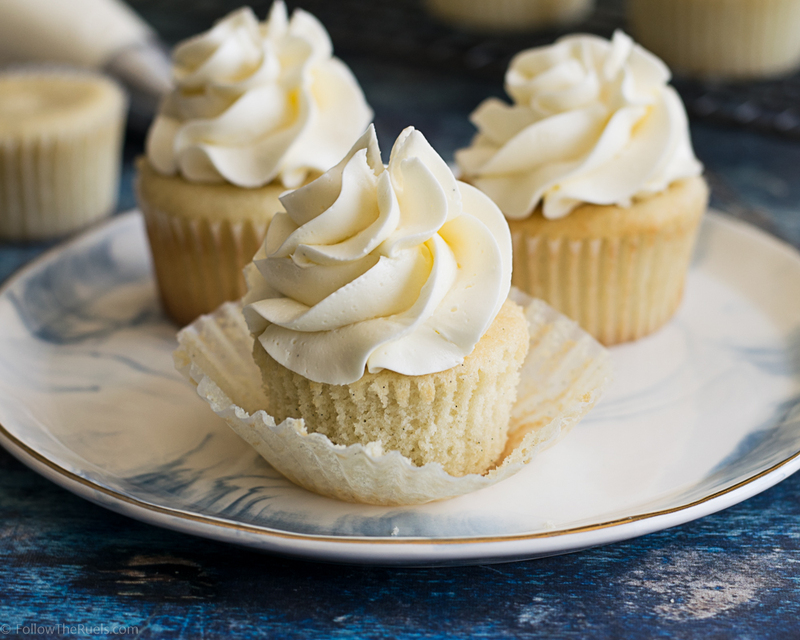 The beauty of these vanilla cupcakes is that they can be paired with anything. Here I just paired them with my favorite buttercream frosting, which was still delicious. But they can be paired with chocolate frosting, caramel frosting, strawberry frosting. Maybe even filled with lemon curd, chocolate sauce, or raspberry jam. They are the most delicious canvas for any of your cupcake creations! In a separate bowl, cream together butter and sugar until light and fluffy. Mix in the eggs, one at a time, until just combined. Mix in vanilla bean paste. Add vinegar to milk and stir to combine. Add a third of the flour mixture to the butter and egg mixture. Mix until just barely incorporated. Add in one half of the milk and mix until just barely combined. Repeat with half of remaining flour and remaining milk. Then finish mixing in the rest of the flour mixture. Let cool in tin for 5 minutes, then transfer to a wire rack to cool completely before frosting. Replace vanilla bean paste with 1 vanilla bean and 1 1/2 tsp vanilla extract or 1 tbsp vanilla extract.